SAP MM (Materials Management) is one of the fundamental modules of SAP ERP system that is implemented in most of the installations of SAP. This module is related to the logistics part of SAP solution. 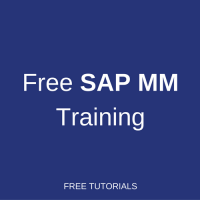 Our team at ERProof developed a free online course that will help interested people to learn SAP MM by following our free tutorials. This training course is currently under development. You can browse selected modules of this course using the links below. New links will be added over time. Sir, I am interested in SAP MM online training. Can you please help with some more information. Happy to write you here..
Nice of your intentions towards learning SAP MM. If you have relevant work experiences like in Procurement/Inventory/Production etc, would be easy to understand the process flow in AP R/3. SAP MM is one of the finest & important module in SAP ERP, very vital in manufacturing and trading industries as it mainly dealing with “Procurement” & “Inventory management”. If not, no worries, if you have a desire, just proceed through proper training from SAP Authorized Center’s like Atos, Lithan Genovate etc.Kindly write me, in case you looking for more assistance on it. Hello…i want to learn sap plant maintenance module. I am an electrical maintenance engineer. So want by enhance my skills. So please guide me how to proceed. What is the average cost of MM module and time duration. What options are available in Delhi NCR for training. This is Yuvaraj. Having hand on experience of 12 Years in SAP MM module but it is back end process like worked as a Material management Manager (Planning , inventory Management, Procurement). Now looking forward to work directly in SAP MM module. Can you guide how to proceed further in this field. any jobs on sap mm . i got trained on sap mm. Hy I m really interested in sap mm and I want to get in asap plz can u help me which institute is best and I want to get regular classes in a good institute and how much the cost would be. I am Asma from Bangladesh.I am working in a multinational company.I am working here SAP MM Module as a key user.I want to enhance my knowledge in this field.In future I want develop my career as a MM consultant.So Please suggest me. I am Radhika, working as a procurement professional and using SAP MM in my organisation to smoothen my work. But now I want to make my career as SAP MM consultant. Request you to please guide me how to proceed further. What about the lessons ahead of tutorial 3.12? How to access them? They are not ready yet. We are working on these lessons and will publish them soon! Does the above mentioned topics cover entire MM?? Sir I am 12+ student.can i learn SAP course? I Hv one year experience in MM module as a end user. And I attended 2 months course in that. So Nw am looking for SAP MM consultant job plz give me some suggestions. Hi, can I have the schedule for the course ? I am a seasoned professional and have a vast diversified working experience of 22 plus years, working in Supply Chain Cadre in Oil & Gas Industry. Although, I had worked with SAP MM module but with user rights. In my current position, I have not been supposed to work on SAP. I have a masters Degree in Commerce (M.Com) with Finance as majors. I am also a Certified Supply Chain Manager (CSCM) from International Supply Chain Education Alliance (ISCEA) body. Now I am planning to offer Supply Chain Consultancy with SAP. Would you please assess this idea as per your experience and what should I have to do to achieve it. Right now I am working in Iraq on 6 weeks / 6 weeks rotation basis. Hey, I am from India. Does this certification that you have done from ISCEA is good? I am a production and purchase executive and would like to enhance my knowledge in this field. Would this certification help me change my career path. I am interested in SAP MM. Please reply to my email with details. I’m having 02 Years experience in SAP Material Management (Procurement & Inventory). I want to learn more about SAP-MM. i am a salesman and storekeeper for a big company and want to learn SAP materials management and SAP sales online. I would like to have training in SAP MM module. I have 7 years experience production, inventory and purchasing in manufacturing environment. Currently, I am based in US and would like to switch job as SAP MM consultant. Can you please provide training details. i am working as a Manager Technical support Having 10 years of experince,now i want to learn SAP MM module. I am Sudeshna from Mumbai. I am having 2.5 years of experience in different domain but interested to shift to SAP ERP modules(specifically MM module). I have actually less time so could you please tell me if any online training/certification can be provided within the budget. In the final training, certificate will issue to me or not ? If I want to get certificate can you send it to saudi arabia?